Historically, debt markets in Gulf Cooperation Council (GCC) countries have been unable to qualify for inclusion in emerging-market fixed income indexes, or any other major fixed income index. The qualities associated with GCC countries, such as higher per-capita income levels and investment-grade debt, tend to exceed the criteria for index inclusion, even though they possess characteristics on par with emerging markets. Here, Mohieddine (Dino) Kronfol, chief investment officer, Franklin Templeton Global Sukuk and MENA Fixed Income Strategies, explains why he and his team think the planned inclusion of the GCC in the prominent J.P. Morgan Emerging Market Bond Index (EMBI) could be an exciting milestone for the region. The recent announcement that Gulf Cooperation Council (GCC)1 countries are planned to be included in the Emerging Market Bond Index (EMBI)2 is an exciting milestone not only for the region, but for the wider fixed income universe, in our view. J.P. Morgan is planning to add sovereign and quasi-sovereign debt issuers from Saudi Arabia, Qatar, the United Arab Emirates, Bahrain and Kuwait to the index between January 31 and September 30, 2019. This index expansion offers investors exposure to another region of bond opportunities within the index. Oman, the sixth member state of the GCC, is already included in the EMBI. This change will effectively bring all GCC member states into the index. J.P. Morgan’s EMBI inclusion criteria for emerging markets currently relies on an index income ceiling (IIC) classification (a gross national income per capita below US$18,769), and a credit rating below investment grade at A-/A3 for three consecutive years. Interestingly, Oman is the only GCC country already in the EMBI due to its low gross domestic product (GDP) per capita. The remaining GCC countries have higher income levels than most other emerging markets, and their debt bears investment-grade ratings. So, these countries don’t quite fit within the parameters outlined for the J.P. Morgan EMBI. As such, a change has been proposed that introduces a purchasing power parity (PPP) ratio4 to the EMBI. Countries with a PPP ratio below 60% will fit within the parameters for index inclusion even if their gross national income per capita is above the index income ceiling, or if their credit rating is classified as investment-grade. In our view, it would increase liquidity and the size of the investible emerging-market universe as GCC bonds would become more visible to international investors. 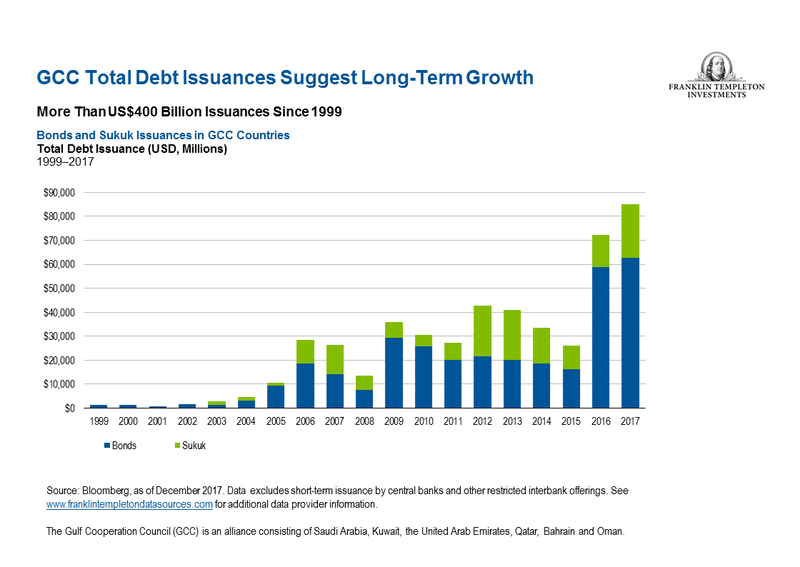 A recent record-breaking year of GCC debt issuance—which includes traditional bonds and sukuk—to the tune of US$85 billion in 2017 came as a result of GCC governments’ efforts to diversify economies away from a reliance on fossil fuels. In conclusion, we view this as a positive development that indicates that the GCC region could be on more solid footing than before, due to the development of the region’s financial markets and a heavy government reprioritization on spending during periods of oil price volatility. And, as the region’s economies continue to reform and develop, we think its inclusion in the EMBI will offer investors even more potential for fixed income diversification. All investments involve risks, including the possible loss of principal. Bond prices generally move in the opposite direction of interest rates. Thus, as the prices of bonds in an investment portfolio adjust to a rise in interest rates, the value of the portfolio may decline. Investments in foreign securities involve special risks including currency fluctuations, economic instability and political developments. Investments in emerging markets, of which frontier markets are a subset, involve heightened risks related to the same factors, in addition to those associated with these markets’ smaller size, lesser liquidity and lack of established legal, political, business and social frameworks to support securities markets. Because these frameworks are typically even less developed in frontier markets, as well as various factors including the increased potential for extreme price volatility, illiquidity, trade barriers and exchange controls, the risks associated with emerging markets are magnified in frontier markets. Stock prices fluctuate, sometimes rapidly and dramatically, due to factors affecting individual companies, particular industries or sectors, or general market conditions. 1. The Gulf Cooperation Council is an alliance between six Middle Eastern countries: Bahrain, Kuwait, Oman, Qatar, Saudi Arabia and United Arab Emirates (UAE). 3. Source: J.P. Morgan. These figures are estimates only. There is no assurance that any estimate, forecast or projection will be realized. 4. Purchasing power parity (PPP) measures the total amount of goods and services that a single unit of a country’s currency can buy in another country. PPP can be thought of as an alternative currency exchange rate but based on actual prices. 5. Bloomberg, as of December 2017. Data excludes short-term issuance by central banks and other restricted interbank offerings. See www.franklintempletondatasources.com for additional data provider information. 6. Changes in the credit rating of a bond, or in the credit rating or financial strength of a bond’s issuer, insurer or guarantor, may affect the bond’s value. 7. Diversification does not guarantee profit or protect against risk of loss.